Viva La Mamma! An Italian-American Homage to Mother Italy. 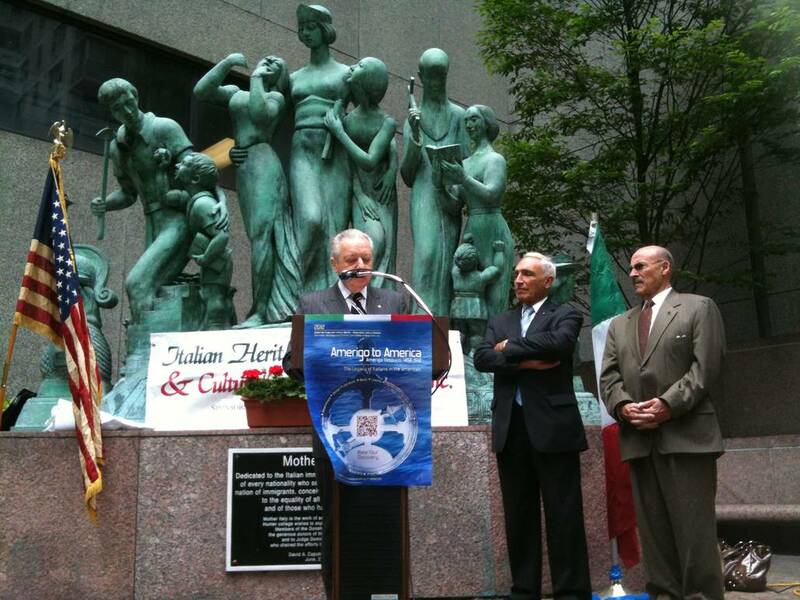 On May 11, IHCC-NY celebrated the annual Mother’s Day ceremony at the Mother Italy Statue at Hunter College and received the moral responsibility of the statue from Justice Dominic Massaro. The ceremony was also the occasion to honor Consul General of Italy to New York Natalia Quintavalle for her role in the Italian-American community and as a proud Italian mother. On May 11, the Italian Heritage and Culture Committee celebrated the annual Mother’s Day ceremony at the Mother Italy Statue at Hunter College. This year’s ceremony was a very special one, as it marked the day in which the moral responsibility of the statue was passed from Supreme Court Justice Dominic Massaro to the Italian Heritage and Culture Committee. The Mother Italy Statue, completed in 1953 by Italian sculptor Giuseppe Massari, expresses the struggles of the Italian youth as immigrants, and perpetuates the past with the figures of Columbus and Dante, located at the two sides of the bronze artwork. A remarkable cultural piece, the statue has passed over the years through the hands of sculptor Massari to a noted resident of the Bronx, Nicola Brunori, then it was shepherded by Justice Dominic Massaro, and restored in 1990 with the help of the Italian Historical Society of America. The statue finally found a permanent collocation in Hunter College’s Poses Park, where it was placed on June 26, 2000. The ceremony was also the occasion to honor a proud Italian mother and a woman whose active role in representing contemporary Italy had her quickly earning the respect and the affection of the Italian and Italian-American community in New York, Consul General of Italy to New York Natalia Quintavalle.